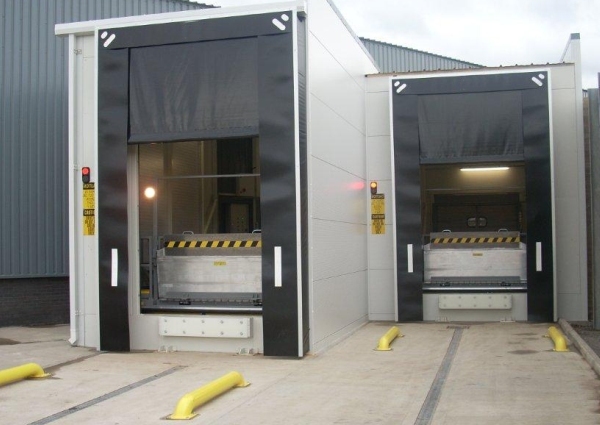 Our standard Dock Shelters allow up to 1000mm height variation between vehicles. If vehicles with a larger height variation are to be used on the same loading bay (e.g. delivery vans up to double deck trailers) then our Roller Blind Shelter is required. This is essentially a collapsible type Dock Shelter fitted with an electrically extending driven head curtain, allowing up to 2500mm height variation of vehicle. Once a vehicle is docked, the Roller Blind is activated causing it to extend down. As soon as the head curtain touches the roof of the trailer, the Roller Blind stops extending. It will also follow the vehicle as it changes height during (un)loading.